The Lost Sales transaction gives you the chance to record missed opportunities. Through the Lost Sales transaction you can record sales you have lost because an item was out of stock or because you do not carry a particular brand or line of merchandise. The best case scenario is that you can use your Lost Sales as a chance to close a sale with the customer at a later time, once the merchandise they are looking for is in stock. At the very least, tracking Lost Sales can give you valuable insight on how you could improve your business through optimal inventory. There are two kinds of Lost Sales: Catalog Lost Sales and Non-Catalog Lost Sales. Catalog Lost Sales are sales that were lost because, though the specific item the customer is looking for is in your Items Catalog, you did not have that specific item in stock at the time the customer was looking for it. The vast majority of the time, a Catalog Lost Sale results when a customer finds a Style she likes but you do not have the right size or the right color in stock. To record a Lost Sale, enter the Lost Sales screen from the Transactions menu in the Main Menu. The Lost Sale screen is very similar in appearance to any other Transaction screen. Enter the item or items that the customer is looking for just as you would enter items into an Invoice. The items you enter will appear along with a subtotal. However, these quantities are merely for reference: a Lost Sale does not affect inventory. (See the How Transactions Affect Inventory topic). If the customer is willing, you can also capture the name (and other data) of the customer looking for the missing merchandise in the Customer Subform. This gives you the opportunity to "rescue" the lost sale by asking the customer if she wishes to be notified when the merchandise she is looking for becomes available. If that is the case, select the "Advise Customer" checkbox. In the example below the customer, Martha Jones, was looking for the Impressions boot, in Size 8.5 and color Blue. Since the item was not in stock, no sale was made. However, Ms. Jones does wish to be advised of when the Blue, Size 8.5 Impressions boot becomes available and she left her address and telephone number. Following up with her means you stand to make an $80.00 sale you would have probably lost otherwise. Once you press F12, the lost sale will be stored in the Documents>Lost Sales catalog. Make sure you have someone regularly search through this catalog (they can do a Query for Lost Sales that have the "Advise Customer" checkbox selected) to make sure customers are promptly notified when their merchandise arrives. Once the Lost Sale has been "rescued", click on the "Advised" checkbox so that you keep track of which customers have been notified and which are still pending. You can run reports from the Documents>Lost Sales catalog that show your lost sales for a given time period and add up the total dollars lost due to items being out of stock. This is a very important report to run as a manager as it will give you an idea of how good your inventory control really is. If month after month your Lost Sales are not declining, you need to make a greater effort of making sure you are stocking the right items. For more help, see the Inventory Optimization topic. The second kind of lost sale is a Non-Catalog Lost Sale and is used when a customer asks about an item that is not in your Items Catalog. In other words, the item is not out of stock--you never decided to stock it in the first place. 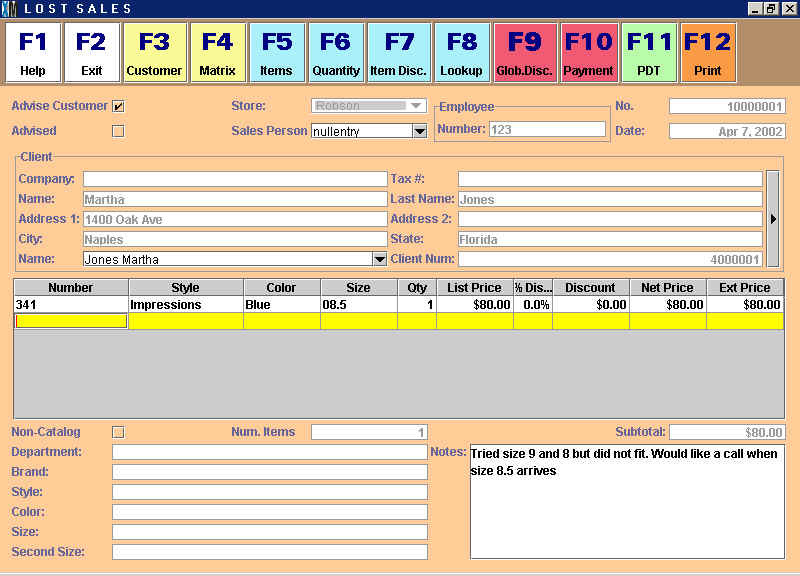 Use the bottom of the Lost Sales transaction screen to capture these kinds of lost sales. A customer might walk into your store and ask, "Do you carry Dr. Martens shoes?" If you do not, you can capture this potential missed opportunity by entering Dr. Martens into the Brand field. Similarly, the customer might ask if you have any swimsuits when you do not (Department), if you stock any "retro" sneakers (Style) or if you carry any Petite clothes (Size). Some of what you capture in the Non-Catalog area may be junk or be so far removed from your core business that you can safely ignore it. But you can also think of the Non-Catalog Lost Sales as free customer research. These are actual customers walking into your store looking for merchandise. If you begin to see more than a couple customers inquire about a specific brand or line or merchandise, you would be wise to pay attention. Lost Sales can provide valuable input into your purchasing decisions.